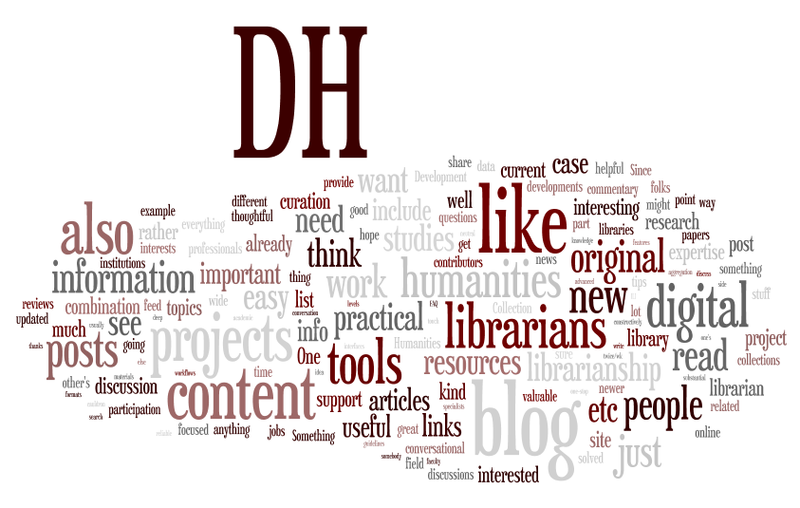 A bit of backstory: in March 2012, a conversation bubbled up on the newly-created ACRL Digital Humanities discussion group (DH DG) listserv about the need for a blog or online resource for those of us “big tent” information professionals– librarians, archivists, curators, and students–engaged with digital humanities. But should it be a blog? A website? A magazine? What sort of content would be most helpful? And what audience should it serve? Aimed at libraries? Museums? Archives? Or casting a wider net? These discussions occupied part of an in-person meeting at the June 2012 ALA Annual conference in Anaheim (Bob Kosovsky, in attendance, has helpfully shared his notes). Not wanted to restrict these decisions to those who made it the distant conference room in the Disneyland Hotel, we circulated an informal survey on the DH DG listserv over the summer of 2012 to gauge preferences. Here are the results of that survey. Librarians were the top respondents to the survey; of the 83 submissions, 65 identified themselves with this category. 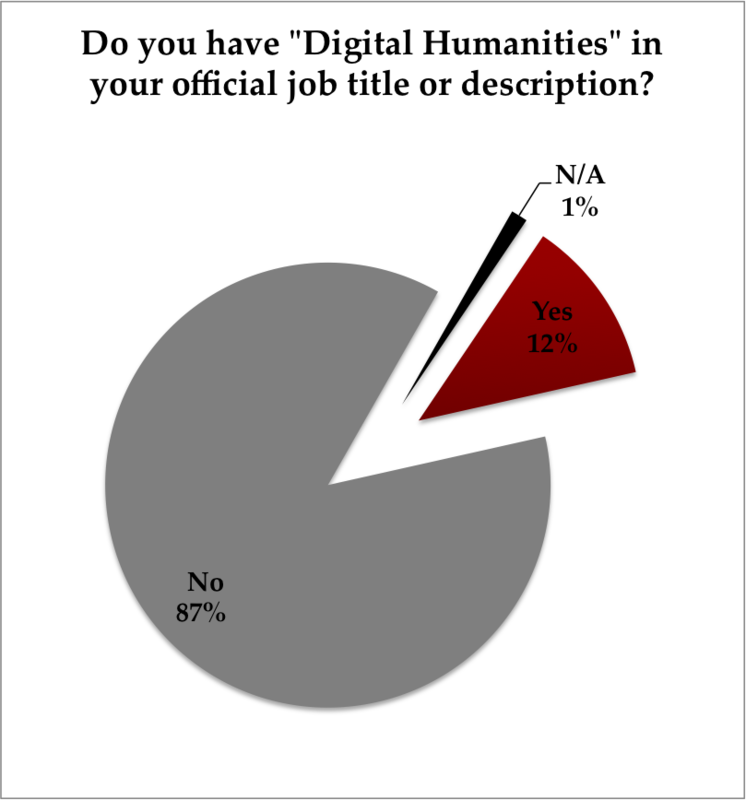 Additionally, most respondents did not have “Digital Humanities” as part of their job descriptions or titles. A slender majority of respondents hailed from institutions that either host or plan to host dedicated DH facilities; curiously, an impressive 21% noted that these facilities were “under development.” A desire for resources, then, is coming in part from those based in institutions with emergent DH initiatives, or from professionals engaged with DH outside of the bounds of dedicated centers or facilities. The survey attempted to gauge whether the community had a preference for the source of content–aggregated or original– in addition to what themes and stories might be included. The group assembled at ALA in June responded strongly to the question of source, indicating a preference for original blog posts rather than aggregated content. Additionally, we heard requests for content aimed at profiling and spotlighting the work being done in DH in collaboration with libraries. There was a particular interest in case studies around project management. More than 80% of respondents indicated that these features would be “very important” or “important” to their work. Lagging slightly behind these leaders, “Recommendations and guidelines on project management” garnered a 71% positive response. + Examples of DH-related documents created by libraries, including environmental scans, policies, workflows, etc. + ‘frank discussion of the difficulties’ around DH projects. Several respondents emphasized the value and potential of a resource specifically focused on DH and information professionals. 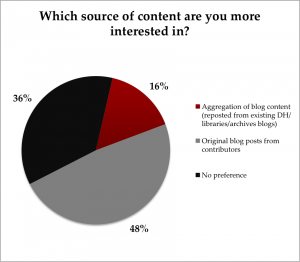 One wrote: ‘ideally, the blog would foster an actual community.’ Another wrote: ‘It seems obvious, but I’d like the site to make sure it fully covers the library angle.’ We saw an eagerness for content that would help librarians do DH well– and better.